Neolithic Architecture, Engravings on Megaliths, Low Relief Sculpture. Typical example of megalithic art. art from the Stone Age tomb culture. see: Oldest Stone Age Art (Top 100). Although to some extent overshadowed by Newgrange Megalithic Tomb - one of the most famous megaliths of the European Neolithic - the burial monument at Knowth is the largest of all passage tombs located within the 8-square mile UNESCO World Heritage site in the valley of the River Boyne, County Meath, Ireland. Estimated to contain more than 25 percent of all megalithic art produced in Western Europe, the Knowth complex contains one large mound (Site 1) plus seventeen satellite tombs. The Great Mound was constructed after Newgrange but before Dowth, sometime during the period 2500-2000 BCE. About 40-feet in height and 220-feet in diameter, and covering more than a hectare, it has two passages (with entrances on opposite sides, east and west), each leading to a separate cruciform burial chamber, with a corbelled roof like the one at Newgrange. The eastern passage is more that 132-feet long, which makes it the longest megalithic passage in Western Europe. The Mound is encircled by 124 oblong kerbstones, each about 8 feet in length, many of which are decorated with prehistoric abstract signs, including numerous petroglyphs with spiral designs. A brief archeological investigation of the Knowth monument was carried out in 1941 by Professor Macallister. However, very little was gleaned about the passage tomb or its prehistoric art, and it wasn't until 1962 that major excavations commenced under the direction of Professor George Eogan of University College Dublin. Eogan and his team began by excavating the Great Mound as well as the smaller surrounding mounds. Five years later they uncovered the first passage and burial chamber. Later excavations revealed the second passage, plus a collection of decorated kerbstones - one of the greatest caches of Western European Neolithic art - which were positioned in such a way that their engravings were hidden from sight. Found especially on stones near the entrances to the passages, most of the decorative art consisted of spirals, lozenges, crescents and wavy lines, together with lunar maps and an image of a sundial or lunar calendar. Using these and other discoveries, Eogan gradually built up a picture of how Knowth evolved as a ceremonial necropolis. Some issues, however, remain a mystery. For example, at first glance, the east-west alignment of the underground passages at Knowth, suggests that they were deliberately positioned to line up with the equinoxes. If so, this design no longer applies: not only have the original entrances to the passages been altered, rendering it impossible to establish if an alignment existed in the first place, but also a concrete slab wall was erected across the mounds west entrance, preventing any further investigation into the matter. For more about research into alignments and archeoastronomy at Knowth, see The Stars and the Stones: Ancient Art and Astronomy in Ireland (1983) by Martin Brennan. The Neolithic era in Ireland ran from about 4000 BCE to 2000 BCE. During this time, the early Boyne Valley farmers cleared the area of forests in order to farm cereals and graze their animals. The fertility of the soil provided the people with sufficient resources to organize themselves into social groups and create a number of megalithic tombs. In due course the tombs of Brugh na Boinne - comprising the three mounds of Newgrange, Knowth and Dowth plus satellite graves (many of which appear in the earliest Irish literature) - evolved into the most famous megalithic cemetery complex in Ireland. It is believed that the Knowth tombs took more than 30 years to complete. Knowth's two cruciform chambers were topped with corbelled roofs supported by lintels placed across wall orthostats. The roof stones of the chambers were arranged in a series of overlapping circular patterns, and then covered by layers of clay, sod, soil and shale, as were the two passages. The entire mound was then ringed with large kerbstones, weighing up to four tons. To maintain the interior in a dry condition, drainage channels were cut into the roof. In the opinion of scholars, the passage graves at Knowth and Newgrange constitute one of the greatest achievements of Neolithic architecture. In particular, the design demonstrates a keen awareness of load stress, geology and engineering abilities, while the overall expenditure of resources is evidence of a powerful belief in the hereafter. Knowth's passage graves should therefore be seen as extremely important cultural centres, with great religious and ceremonial significance. This last is supported by the fact that the number of individuals buried in the tombs was relatively small, showing that the monument possessed mostly ceremonial or ritualistic value, possibly associated in part with the vernal equinox (the start of the growing season), and the autumnal equinox (autumn harvest time), with which the monument may have been aligned. According to Professors Kinnes and Eogan, Europe's greatest concentration of megalithic art is found at Knowth - a total of 250 ornamented stones, including internal orthostats, sills, capstones and external kerbstones. This unique accumulation of Stone Age art consists mainly of abstract geometrical engravings, created by chisels and punch stone tools, or the sharp edge of probably flint or obsidian implement. In addition to these incised pictographs, ther deeper works include low relief sculpture, usually of figurative images. Slab surfaces were often smoothed with hammers. Most motifs were symbolic, religious or ritualistic - perhaps due to the fact that the abundance of food in the Boyne valley meant that people could look beyond their daily survival to consider deeper questions concerning life and the afterlife. The use of decorative art thus provided a permanent visual confirmation (and iconography) of their ideology, although few scholars agree on a precise interpretation, except that a huge amount of time, effort, and skill was involved in the creation of this art, which shows how important it was. Some have suggested that the prehistoric rock engravings on the stones are essentially anthropomorphic, with spirals representing eyes of gods associated with places of burial. Others attribute these Neolithic symbols to a sun-based religion. Yet others believe that the act of engraving was the primary ritual, not the images themselves. 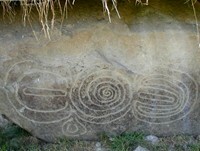 Some anthropologists believe that Knowth's geometric and phosphene-type images were created by individual artists experiencing altered states of consciousness. This theory suggests that through certain Shamanistic rituals (very common among primitive cultures) - involving prolonged drumming, chanting, fasting, consumption of hallucinatory plants, and so on - individuals can enter an altered state of consciousness, during which they tend to create certain types of abstract shapes. A process not unlike doodlings made by people while speaking on the telephone - which, incidentally, closely resemble the dots, circles, triangles, spirals, wavy lines and strange grid marks that we see in megalithic tomb art. Meantime, Martin Brennan believes that the rock art at Knowth has a lunar or astronomical basis. In support of this, he identifies numerous associations between Knowth's megaliths and the moon and stars. These include maps of the moon, as well as calendars based on the rhythm and positions of the sun, moon, and stars, possibly to help regulate agricultural activities such as planting, harvesting, and moving of domestic animals. In summary, Knowth's ancient art was created by engravers and sculptors from a prosperous culture, capable of complex thought, and which possessed the resources, organization and value-system to create sophisticated, lunar-related funerary monuments. If Paleolithic art is defined by ivory carving, the mysterious "venus figurines" and parietal cave painting, Neolithic artists are mainly associated with ceramic art (pottery), textile art (weaving) and megalithic rock art. The oldest art involving megalithic carving is to be found at Gobekli Tepe in southeastern Turkey. Dating to as early as 9000 BCE, it consists of bas-relief carvings and numerous stone engravings. Ancient Egyptian architecture, in the form of Egyptian pyramids, is another major example of Neolithic-era megaliths. Other important Neolithic sites include Catal Huyuk (c.6100 BCE), Gavrinis (c.3500 BCE), Zuschen Tomb (c.3300 BCE), Newgrange (c.3100 BCE) and Stonehenge (c.2600 BCE). As the Neolithic entered the Bronze Age, precious metalwork came to the fore, in the form of bronze sculpture such as the sensational figurine known as the The Dancing Girl of Mohenjo-Daro (c.2,500 BCE), from the Harappan culture of the Indus Valley civilization, in India. Other masterpieces include the Maikop Gold Bull (c.2,500 BCE) from the North Caucasus, and Ram in a Thicket (c.2500 BCE) an exquisite statuette in gold-leaf, copper, lapis lazuli, and red limestone from Ur in Mesopotamia (present day Iraq).  For more about artifacts from the Paleolithic, Mesolithic and Neolithic, see: Earliest Art.